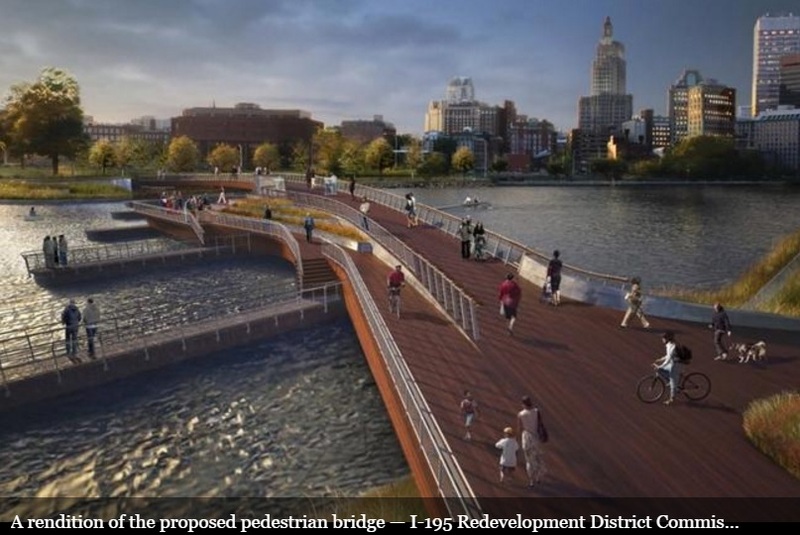 Building a better bridge for people to enjoy, across the Providence River. The following letter was sent to the newspaper in Providence, Rhode Island and to the state’s department of transportation. Please feel free to add your comments in the section below. The Providence Journal reported on July 20, that RIDOT is rethinking the pedestrian bridge on former I-195 land (rendition is shown in the header above). The reason being that the lowest bid was $3 million more than the available funds (approx. $13 million). Three companies in the mid-range bid roughly $5 million more (approx. $18 million). These mid-range bids are probably the realistic cost, because experts in bidding say that the lowest and the highest prices in any bid process can reflect mistakes or wild-eyed optimism. The cost of about $18 million sounds high, but it could be the result of the design, namely a concrete bridge with many curves, twists, and turns. That is a lot of hand labor to make the forms, install the steel reinforcing bars, and then to pour a lot of expensive (high tensile strength) concrete in exactly the right way, one layer at a time, etc, etc. This situation could be a blessing in disguise. It gives us a chance to reconsider the design —and the financing. Let’s consider an alternative that would cost the state less, get more people involved in building it, provide us with enjoyable experiences, create jobs, attract tourists, and put RI on the map for innovation and creativity. One way to do this is to build a modern version of the Ponte Vecchio in Florence, but do it in partnership with the private sector for both construction and financing. This concept has two elements: the design phase and the financing/construction phase —each element impacts the other. The design would build a bridge with a center lane for pedestrians and have shops and office spaces along the sides. Midway across should be an open area —a plaza for outdoor cafes and for viewing the city and the river. Ponte Vecchio does this too, in a way, but in stone, brick, and stucco. The modern way to do it would be with glass —that way shoppers, diners and office workers can see the city from inside the bridge. 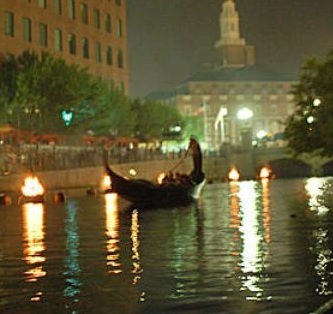 Better yet, we who view it from the outside at night will see a fascinating, gleaming, multicolored crown over the river. We would see it when walking or driving along the river. We would see it when in a boat or gondola, passing underneath. Imagine the magical effect, if part of the pedestrian walk were paved with multicolored glass pavers, made by artists from all over RI, each creating her or his own mosaic design. If you have not been to Florence and seen the Ponte Vecchio, go now, to Google Images and then read the Wikipedia article. Notice that their bridge is 105 feet wide. Our bridge could be 120 feet wide, given the existing foundations that are still standing in the Providence River. The Ponte Vecchio has a center span of 98 feet plus two side spans of 89 feet each. Our bridge footings look to be 75 feet apart (per Google Maps). Our bridge would be 400 feet long from shore to shore. Eden Project in Cornwall England. Pulteney Bridge across the River Avon in Bath, England. Krämerbrücke (Merchants’ bridge) –a medieval bridge in Erfurt, Germany. These bridges demonstrate how local residents and tourists enjoy visiting these unique places. This is the best part of the concept, IMHO, because it shares the cost (:–) with private investors and makers. First, RIDOT should build and pay for the steel framework of the bridge, plus piping for utilities, telephone, and Internet cables. Second, RIDOT should invite businesses and universities in RI to participate in the project. Another way is to encourage corporations, universities, insurance companies, hospitals, and pension funds to invest in the units (which would be built by someone else). The investments can be done as mortgages or condominium units or shares in a for-profit corporation. These private entities already invest their profits and endowments in a variety of mutual funds, REIT’s, and even in real estate. The bridge units or shares would be one more form of investment —one that can have tangible benefits for the investors, as well as advertising and image advantages. How many units could be built? If the bridge is 400 feet long and we subtract 40 feet in the middle for the public plaza and cafes, that leaves 360 feet on each side for units. If each unit is 20 feet wide, then we get 18 units on each side, or 36 total. Units could be 20 feet wide by 40 feet deep (that assumes a bridge 120 feet wide and a middle road of 40 feet —20 feet for 2 bike lanes in the middle plus two sidewalks of 10 feet each). Sure, some investors will want to own two or three units in a row, to make a good sized restaurant or office or shop. My recommendation: we should reserve 4 units for affordable housing, maybe funded by RI Housing. These would be “gatehouses” (two at each end) —the tenants should be responsible for providing some simple form of security at night, if only by having eyes and ears on the place when the shops close. RIHousing or one of the non-profit housing groups in Providence could also be partners. Private participation and partnerships will require layers of corporate structure: for example, the State owns the piers and bridge bed; and a for-profit corporation owns the air rights. The State and the City should have rights of first refusal to buy back shares in the for-profit corporation or the condominium corporation (whichever way this is structured). Where can the cash come from to buy these units? Answer: from two “sunny day” investment funds. The State should identify the increased sales and income taxes that it gains from the I-195 development and then appropriate a portion into a “sunny day” investment fund. The key purpose of this investment fund is to create a market for the quick and easy sale of bridge investment shares. That in turn will encourage the private sector to invest endowment funds in this venture, knowing that the future sale of shares will be facilitated and expedited. The City of Providence should create two investment districts —one on each side of the river, including the I-195 lands. These districts will allow the City to earmark for this project a small part of the increased property taxes from future development on vacant land near the river. That share of the increased revenue flow can then pay for the City’s own bond, that should be allocated to this bridge. For examples of this concept, which has been used all over the US since 1952, read the Wikipedia articles on Value Capture and on Tax Increment Financing. All of these concepts are presented here to start a discussion and a brain-storming process. Along the way, better ideas will evolve. In the end, hopefully the solution will be a partnership of the public and the private sectors. If we can achieve that partnership, to create a unique amenity of our State, we will have gone a long way to fixing RI’s image and business climate. The writer was the Director of Community Development in a town in RI from 1975 to 2005 and then organizer of affordable housing and a planner elsewhere for 7 more years. Currently retired and a volunteer at 3 non-profit agencies. Neither involved a public-private partnership.